Since writing my post about pointcrawling, I've come across a few extra examples that I didn't include in the original. 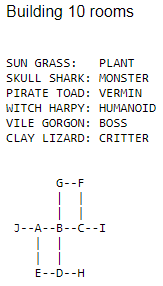 The first is something I stumbled upon by happenstance, the next couple are suggestions from people who read my post, and the last two are ones that I remembered too late. 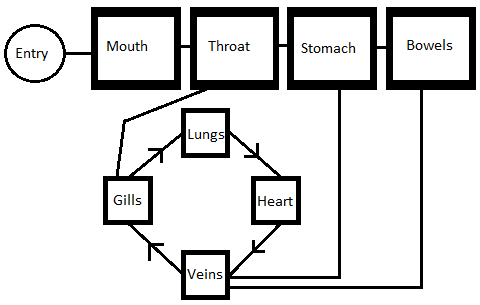 First, Melancholies & Mirth uses a pointcrawl diagram to lay out a dungeon inside the belly of a sea monster, as seen in Figure 1. 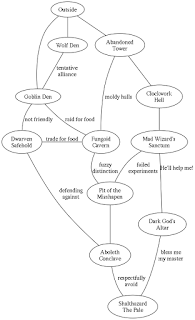 My friend at Role High recommends I Don't Remember That Move's text-based dungeon pointcrawl generator. You can see a randomly generated example in Figure 2. 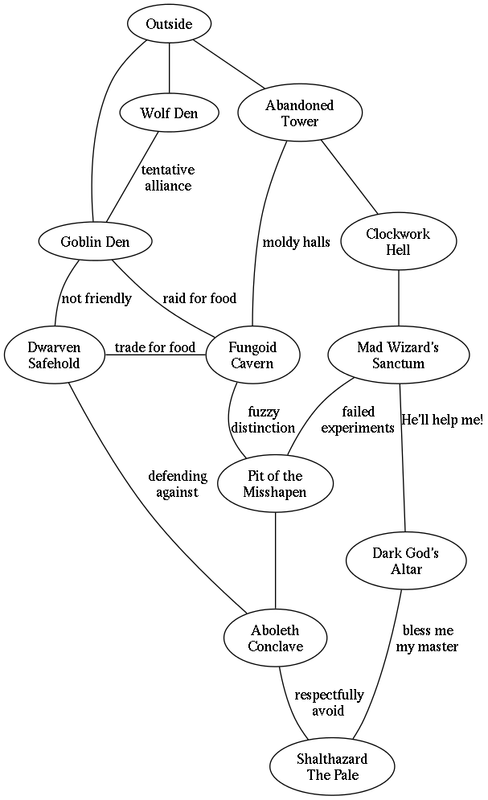 In a similar vein, Eric Nieudan (author of Macchiato Monsters) recommends the DunGen pointcrawl dungeon generator by Ruminations of a Geek. You can see another randomly generated example in Figure 3. 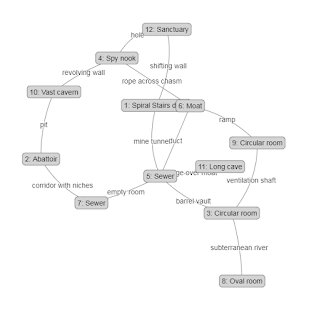 Those examples jogged my memory about a pointcrawl dungeon generator I'd forgotten all about. It was posted several years ago by Land Of Nod, and it's intended to provide random lairs and hideouts for Golden Age supervillains. 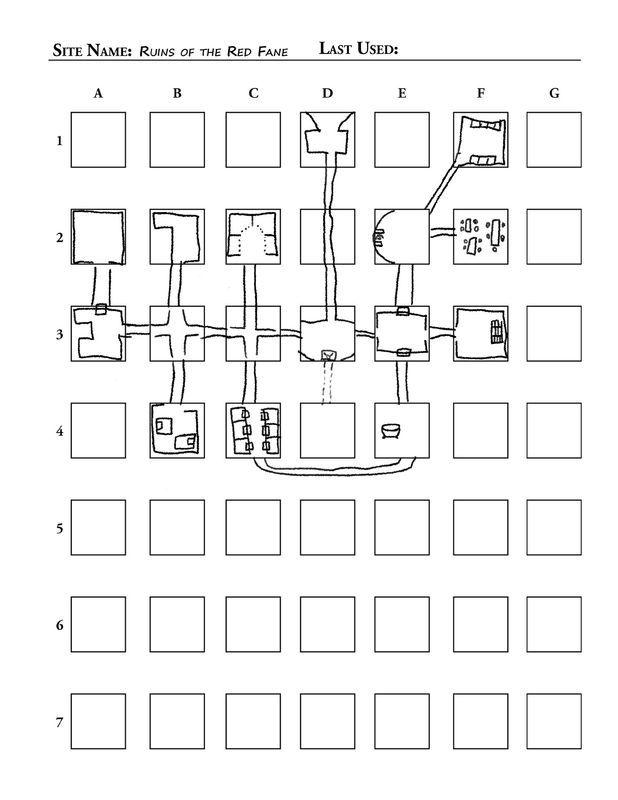 A neat feature of this one is that the pointcrawl you're drawing is meant to be drawn out on hex paper. 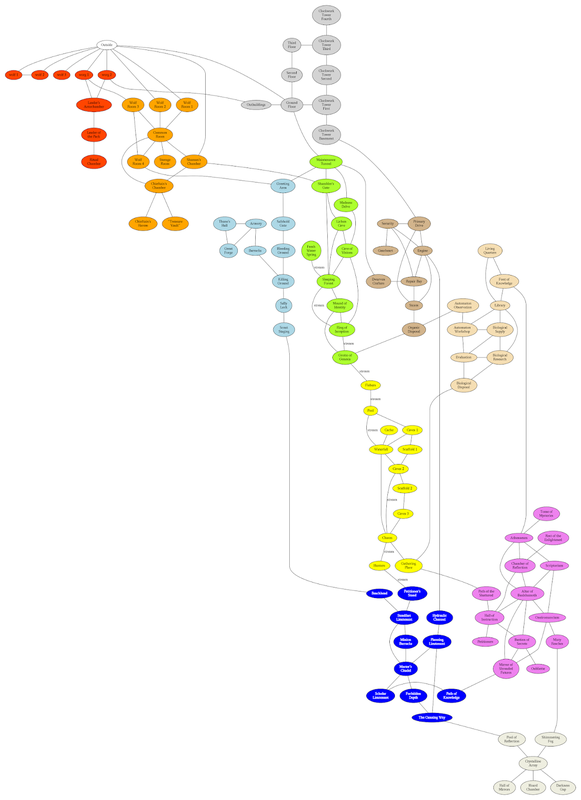 You can see the example Matt Stater made himself in Figure 4. 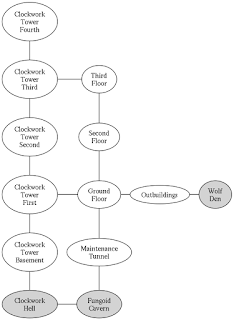 If I understand correctly, there's a relatively simple overview map of the dungeon, depicting each region as a node (shown in Figure 5), then there are maps of each region, depicting each room as a node (an example, showing the region "The Abandoned Tower" is shown in Figure 6), and then finally, there's a much larger map showing the entire dungeon, but with each node still representing one room (shown in Figure 7.) 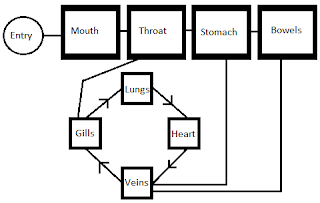 Incidentally, if I have misunderstood, I think it may be the case that even at the finest level of detail, each node represents a grouping of rooms rather than an individual room. 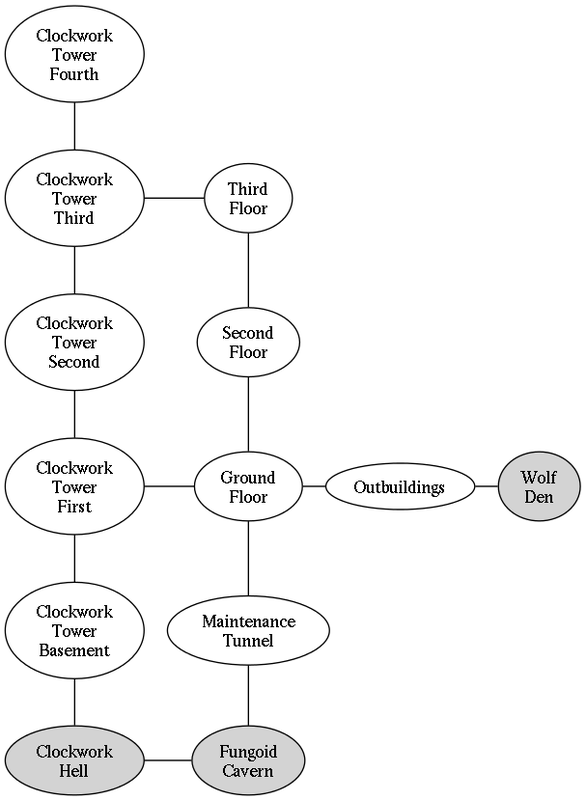 Within each regional node, Keith lays out the role that region of the dungeon is intended to play in a character-goal-driven campaign, the kinds of dangers found in the region, the kinds of treasures and rewards found in the region, the important relationships between the region and other parts of the dungeon, a description of what's visually (or other-sensorally) notable about the region, a rough guide placing the region inside the dungeon, and then a brief description of each room / group of rooms / notable feature within the region. DIY & Dragons on Blogs on Tape! Beloch Shrike, who operates the Papers & Pencils blog, has another project called Blogs on Tape. The purpose of Blogs on Tape is to act as a kind of podcast or audiobook for OSR blog posts. The most recent entry (at the time of writing) is episode 47, where Nick LS Whelan reads aloud my post on running a campaign of avaricious decorators willing to pry up the floor boards of an ancient cathedral to make nice-looking siding for a wealthy patron's potting shed.